Contact Robert if you wish to join the Clan Chisholm DNA project to discover your deeper ancestral heritage, and to see how it is woven into the tartan of Clan Chisholm genealogy. Please note The FTDNA project is administered by an independent group of Society members, and officially supported by the Clan Council. Information is also available in some of the branch newsletters. Many of our members have joined this exciting project on their own. We encourage you to check out this website and to think about joining this project to help unravel the past and protect the future for Chisholms. The 2009 Project Report can be downloaded here. 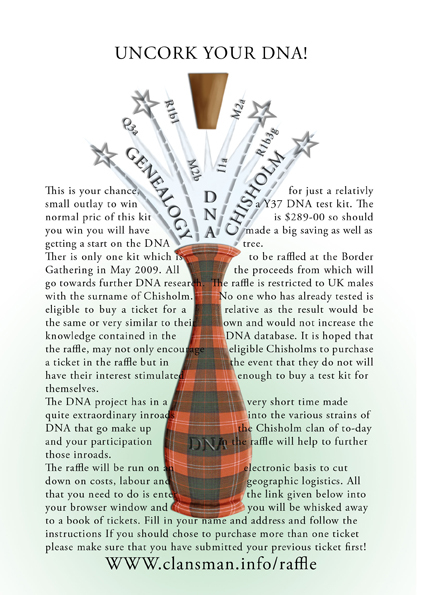 Congratulations to Mr. Keith Chisholm Brown of mid Wales, UK, the winner of our DNA raffle!